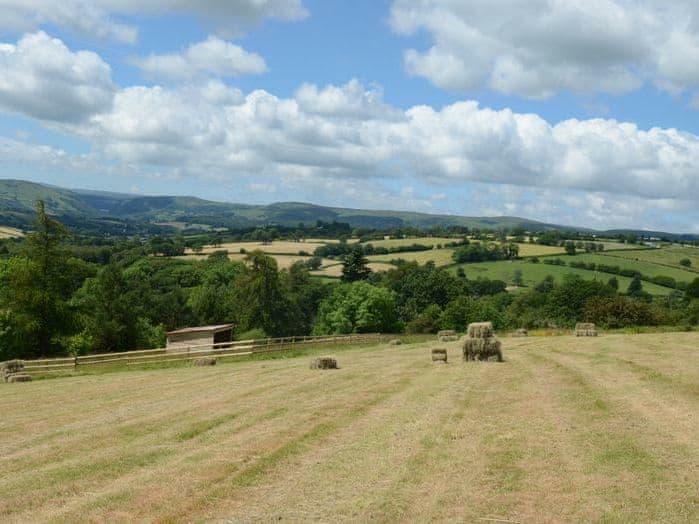 Home to the Brecon Beacons National Park, which offers great walking, climbing and horse riding opportunities, Powys is a beautiful, area with green fields, crystal clear mountain waterfalls and rolling hills. Visit lovely market towns such as Montgomery and don't miss the inspirational Centre for Alternative Technology. 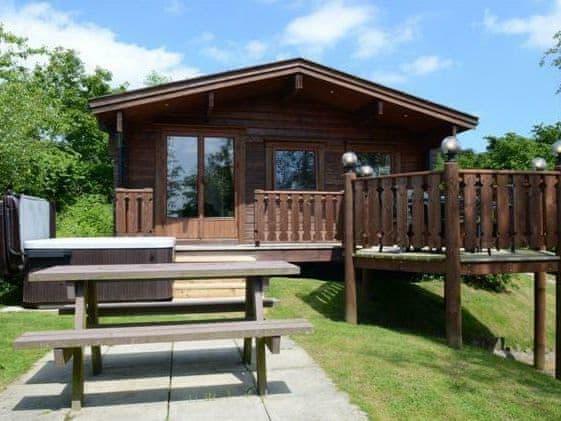 This spacious lodge has a private garden and its own bubbling hot tub.. Steps to entrance. Kitchen area: With gas oven, gas hob and fridge/freezer. Shower room: With shower cubicle and toilet.. Heating, gas, electricity, bed linen and Wi-Fi included. Cot and highchair available on request (£2 each per week). Garden with decked area and garden furniture. Hot tub (private). Private parking for 2 cars. No smoking.. Set on the beautiful Oakwood Lodges resort, this south-facing lodge is every inch the family retreat in the countryside. There’s an open plan living, kitchen and dining space, and you can step straight out into the private garden when you fancy enjoying the peace and quiet and the fresh air. There’s a patio space, with a table and chairs for those al fresco family meals, and that bubbling hot tub makes a very welcoming sight after a busy day walking the local area. The lodge welcomes up to three dogs along too, so you’ll be able to enjoy the garden with them in between those adventures. Back inside, the living space is perfect to watch a family favourite film in the warm or watch the sun set behind the clouds while you relax back in the comfort of the hot tub. Oakwood Lodges is a small, sleepy lodge resort with gorgeous views across the famous Elan Valley in the distance. Known for its lakes, moors, woodland and mountains, we can’t think of a more perfect setting for those of you keen to forget life’s stresses and just enjoy being close to nature. Just over a mile away, the historic town of Rhayader has plenty of eateries, friendly pubs and quirky shops, and the Elan Valley’s just a 10-minute journey away by car. With a bubbling hot tub and a private garden, this south-facing lodge is perfect for that family break.. Steps to entrance. Kitchen area: With gas oven, gas hob, fridge/freezer and dishwasher. Shower room: With shower cubicle and toilet.. Heating, gas, electricity, bed linen and Wi-Fi included. Cot and highchair available on request (£2 each per week). Enclosed garden with decked area and garden furniture. Hot tub (private). Private parking for 2 cars. No smoking.. Eagle Owl Lodge is a bright, spacious lodge with a secluded feel. Set on the peaceful Oakwood Lodges resort, just 10-minutes from the Elan Valley, life at this this home from home is all about relaxation. Oakwood Lodges is a secluded lodge resort with picturesque views across the Elan Valley, just 10 minutes’ drive away. The closest town is Rhayader, the oldest town in Mid Wales, and you’ll find it just a mile away with its many shops and restaurants. With a contemporary design and its very own hot tub, this south-facing lodge is perfect for that escape to Wales.. All on the ground floor. Kitchen area: With gas oven, gas hob, microwave, fridge, freezer and dishwasher. Shower room: With shower cubicle and toilet.. Heating, gas, electricity, bed linen and Wi-Fi included. Cot and highchair available on request (£2 each per week). Enclosed garden with decked area and garden furniture. Hot tub (private). Private parking for 3 cars. No smoking.. With a chic, open plan layout and French doors that lead out to the veranda, Falcon Lodge is the perfect retreat for those of you keen to kick back, relax and enjoy the setting. 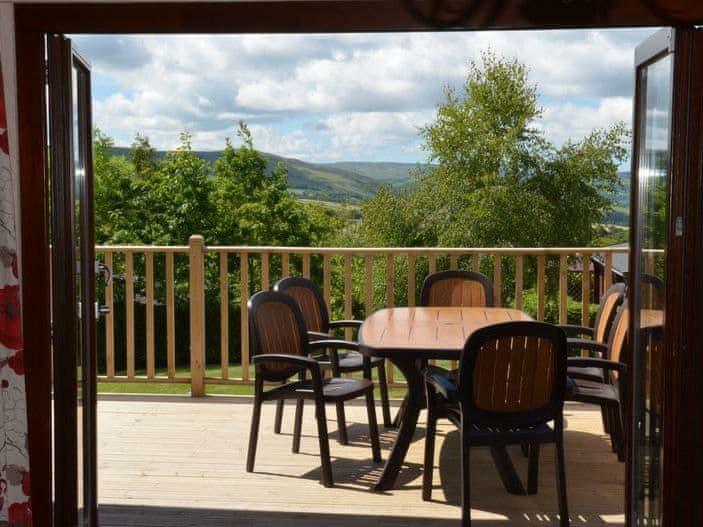 Set on the Oakwood Lodges resort in beautiful Mid Wales, this three bedroom lodge has been designed with spending time together firmly in mind. You’ll find Falcon Lodge on the tranquil Oakwood Lodges resort, just a mile from the historic town of Rhayader. With quirky shops, restaurants and welcoming pubs, it still has the feel of a traditional Welsh town. Just 10 minutes away by car, the Elan Valley makes the perfect playground for those of you who love the great outdoors, and it’s one of the most beautiful areas in the country. A contemporary lodge with a hot tub, private garden and chic design throughout.. Steps to entrance. Living area: With Freeview TV and French doors leading to decked area. Shower room: With shower cubicle and toilet.. Heating, gas, electricity, bed linen and Wi-Fi included. Cot and highchair available on request (£2 each per week). Enclosed garden with decked area and garden furniture. Hot tub (private). Private parking for 3 cars. No smoking.. There’s something about being in Wales that makes you want to spend as much time as possible enjoying the great outdoors, and Harrier Lodge has been designed with its setting firmly in mind. The open plan living space has French doors, so not only is this a bright, airy space to unwind together, but you’ll never be more than a step away from the veranda and that ever-so-welcoming hot tub. Harrier Lodge is found on the Oakwood Lodges resort, and this small, friendly park’s home to a collection of south-facing lodges, each with a secluded feel thanks to clever planting. You’ll find the Elan Valley and its famous scenery just 10 minutes away by car, and the traditional town of Rhayader and its attractions just a mile away. 1 of 2 tree tents Wy Y Ddraig meaning Dragon Egg is bright red the other being the original green Red Kite Tree Tent - Ynys Affalon which are located off grid in this wonderful remote rural woodland location. Each are set in their own private surroundings and can be found beside a small babbling stream and located centrally between the Brecon Beacons Builth Wells and Llandrindod Wells. Making it perfect for long countryside walks through forests and valleys mountain biking fishing and canoeing. Bring your own Yoga mat to work in the open air the lower platform provides the space peace and quiet. The regions are punctuated by mountains and hills. For local shops and other amenities be sure to stop at Newbridge-on-Wye. Llandrindod Wells is also worth a visit for it s spa and museums. A former resort in Victorian times it has retained its look and much of its heritage. Another visitor highlight in the wider area is the buried jewel of the Brecon Beacons Dan-yr-Ogof Caves. This compact tree tent and large open air mezzanine living platforms will be sure to captivate you from the first glimpse through the trees. Down a small bank to the site the tent and living area is acessed via a long sweeping wooden path the tent itself contains a wood burner to keep you warm throughout your stay (an initial supply of logs is provided). Relax in the comfortable double bed at the end of your day and get a good night s rest. The insulated tent is warm and cosy so there is no fear of a cold night and is a great place to relax to the soft sway of the winds and the sounds of nature outside should you just want to chill and take a rest after exploring. Stepping outside of the tent itself and across the small platform you will find an enclosed open air shower area complete with electric shower. The open-air facilities deck has a large table perfect for enjoying a fried breakfast or one pot wonder. The outdoor cooking area provides a two burner gas hob sink with hot and cold running water where you can make your cup of tea or coffee in the morning a whistling kettle crockery cutlery and cafetiere are provided. There is also a cool box for convenience. Use the lower deck to set up your Yoga mat. Walking down from the living platform next to the stream you will find a welcoming fire pit great for a BBQ along with small platform which can be used as a table or for seating. Alongside the fire pit are seats hand crafted from tree trunks spaced around Swedish fire logs. Up the slope a little for privacy is an enclosed WC. If accommodation is required for additional guests the second Tree Tent also sleeping 2 people is Red Kite Tree Tent - Ynys Affalon. Parking is available approximately 10m away with the tent and living areas down a grassy bank. Distinctive get away from it all retreat sleeps 2 2 A back to nature escape with accommodation arranged between a recycled railway cabin and cosy log cabin hand built from local oak a testament to artisan craftsmanship and commitment to treading lightly within the natural environment. Set in 50 acres of private land within the Brecon Beacons this is the essence of glamping - great for fresh air freaks and dogs who are happy to live outside. A friendly welcome awaits you from the donkeys who graze the neighbouring slopes often joined by a rescue pony. There is plenty of adventure to be had without using the car; breathtaking walks fish in the river or take a dip in the river s plunge pool chop wood for the fire pit or hire bikes which can be delivered to the door. Crickhowell is a 5 minute drive with butchers baker Post Office and independent shops. A day trip to Hay-on-Wye famous for its International Literary Festival and canoeing on the River Wye are a must or try trekking in the hills. The oak cabin offers lounge/diner/sleeping area: 1 double accessed via a ladder (restricted head height in the eaves) and 1 bunk beds (suitable for under 8s) and a woodburner/stove (first basket of logs included). The railway carriage offers open-plan kitchen/bathroom area: kitchen area with gas hob Bathroom area with freestanding bath. Separate WC. Outside: large fire pit for camp fire cooking and canopy area with table and chairs for all weather dining. Amenities: ample parking. Bed linen and towels included. Regret no smoking. 2 well-behaved dogs who are happy to live outside are very welcome - no charge. Having designed a small yet perfectly formed space the owner respectfully asks that dogs are kept outside of the cabin. Please could dogs sleep in the back of the car or in a dog crate. There is livestock on the farm so please take care. The group of 4 exquisite huts is exclusively yours tucked away in the hills yet just a run back down the hill into Hay on Wye complete with gorgeous little shops and eateries. A babbling brook the dramatic expanse of the Brecon Beacons Dark Sky Reserve overhead and an optional wood fired hot tub to luxuriate in. The wood-fired hot tub is bookable on request for an additional fee of 120 for a 3 or 4 night stay and 150 for 7 nights. This is a perfect retreat to re-connect and get back to nature .or have a little glamping party with your mates! Located in one of the most spectacular locations in the National Park. Nearby Hay-on-Wye has an exceptionally well supplied yet quaint Thursday morning market pubs great independent stores and a world famous book festival each May and is just a few miles away. The River Wye is far below at the bottom of the mountain with canoe hire a great river side cafe bike pony and even Vespa hire. For thrill seekers Black Mountain Activities nearby has a long list of adrenaline fuelled activities to keep you busy including gorge walking and high wire ropes. Leisure facilities: private wood-fired hot tub (on request for a fee of 120 for a 3 or 4 night stay and 150 for 7 nights). This unique accommodation offers 4 shepherds huts each with a double bed woodburner (logs included). There is a very well appointed Utility Hut which includes: Shower room: with shower and WC. Kitchen: with wood fired Esse stove and sink. The 4th hut is set apart from the main group of 3 huts the 4th hut also includes a double bed and woodburner (logs provided). Outside: an open fireplace with large fire pit at one end and BBQ at the other a large canopied dining table. Amenities: ample parking. Electric included. Bed linen included. Regret no smoking. Additional info:. Electricity is provided by solar panels and wind turbines. Pedestrian access only to the huts via a step track. Easy to carry bags are recommended but wheelbarrows are provided to transport luggage to and from your hut! 2 dogs welcome however must be kept on a lead whilst outside. Arrival: 4pm.